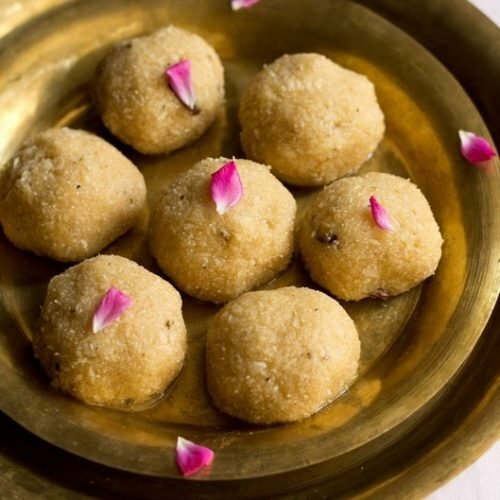 sabudana ladoo recipe - an indian sweet made from tapioca pearls. roast the sabudana (tapoica pearls) in a kadai or pan on a low flame. they will swell a bit and become crunchy and light brown. this process will take approx 25 to 30 minutes on a low flame. also lightly roast the coconut for 2-3 minutes. no need to brown the coconut. in the same pan where you have roasted the coconut, add the ground sabudana powder and sugar. heat the 5 or 6 tbsp oil/ghee in a small pan. add chopped cashews and fry them till golden. pour this whole mixture of oil and browned cashews into the sabudana + coconut + sugar mixture. also add cardamom powdered and nutmeg. stir very well with a spatula or wooden spoon. then when the mixture is still lightly hot or warm, make medium sized balls from it. sabudana ladoo are ready to be served. you can also store sabudana ladoos in an air tight container in the fridge for a week.